The Osceolas would be Patches' second and third 4000-footers. 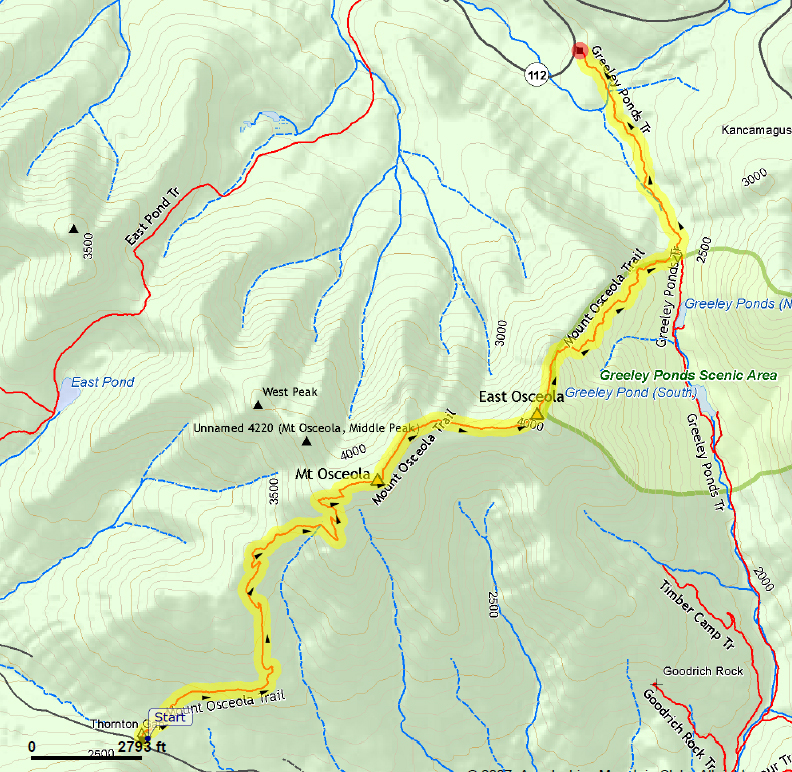 Our plan was to park at the Mt Osceola Trailhead on Tripoli Rd near Waterville Valley, and make a round trip to East Osceola and back, crossing over Osceola twice. This time, I gave Patches a new long-lasting prescription anti-nausea pill the night before. It did work, as she did not throw up either on the ride up to the Mountains or on the ride home. However, she still drooled all the way there, and off and on on the way back. The first part of the trail is fairly straight and viewless. 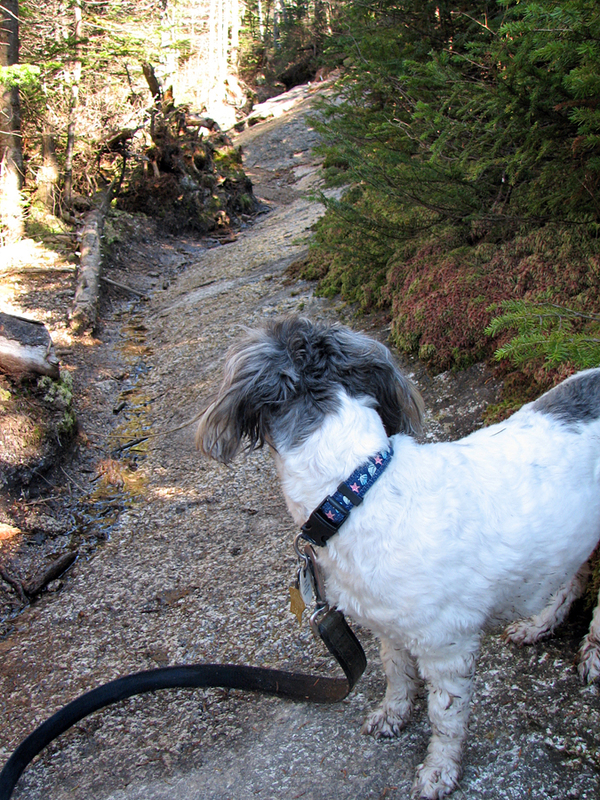 Even though we were the only hikers around, Patches still persisted with her habit of stopping regularly and turning around to watch the trail behind us to see if someone is coming. Sometimes I think she hears something that I don't, but it's just that she still remembers the constant parade of bicycles coming up behind us on the Cape Cod Rail Trail. Partway up, when the trail starts to bend almost impercetively to the left, views of Mt Osceola begin to open up from time to time. 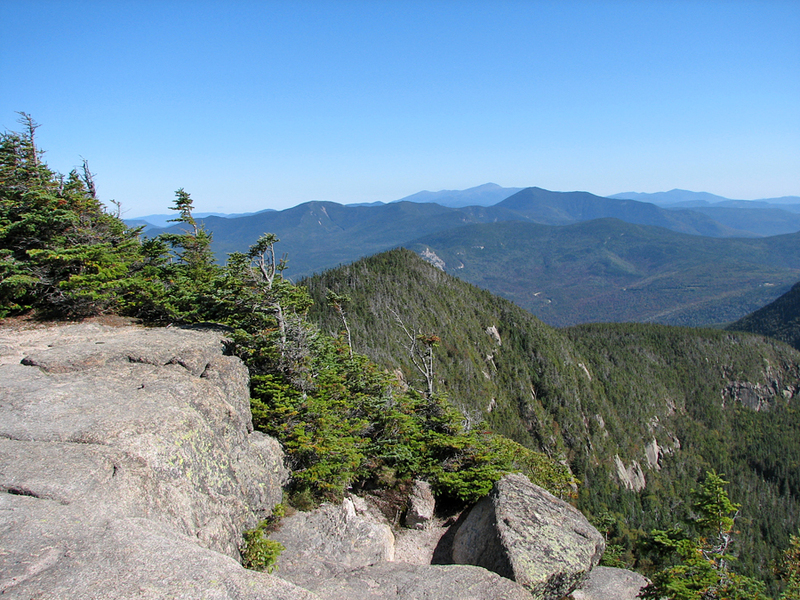 The ridge that the lower part of the trail follows is separated from the Osceola summit cone by a brook running down a small gorge. The trail eventually bears right to cross the head of this gorge in a shallow shady col. We stopped there so I could take a few pictures of Patches, one of which was worth preserving. After a short steep ascent, the trail began switchbacking up the side of Mt Osceola, often over slanted ledges that were damp and slippery but which didn't seem to faze Patches in the least. 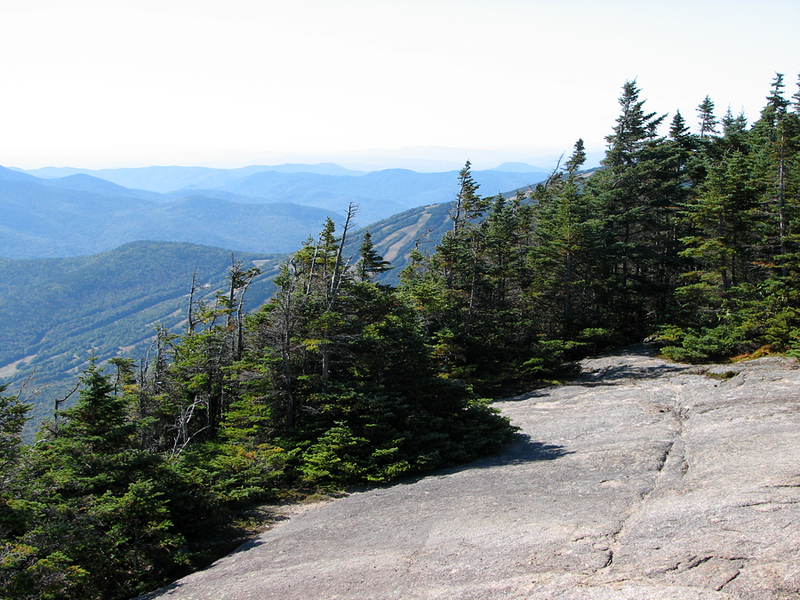 At the top, the views down to Waterville Valley and beyond were spectacular. The day was sunny and pleasant, and Patches seemed to enjoy looking out from the wide open ledges. She didn't seem to have any fear of getting close to the edge, so I held on tightly to her leash just in case she strayed too far. When we just about ready to head over to East Osceola, a couple of guys happened to come up the trail from that direction. 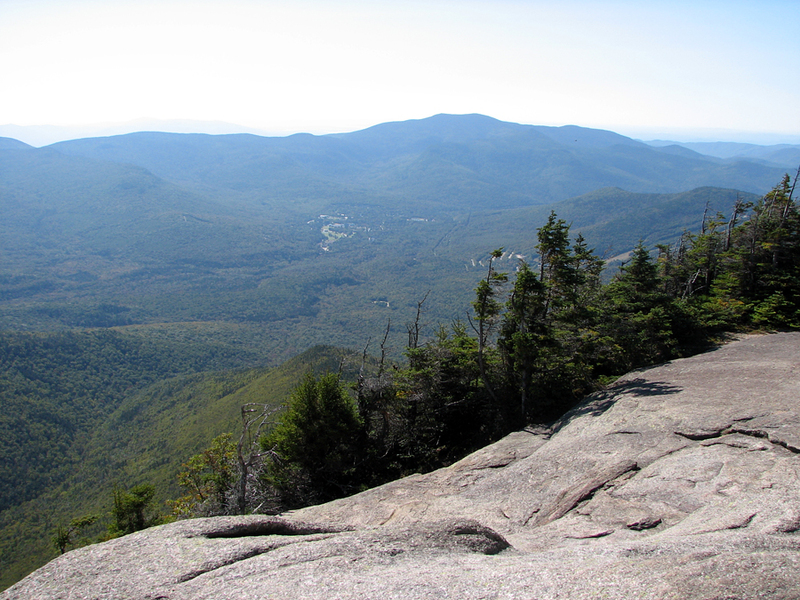 They had hiked up from the Kancamagus Highway via the Greeley Ponds Trail and the eastern leg of the Mt Osceola Trail. One of them had climbed several 4000-footers before; for the other, this was his first trip. 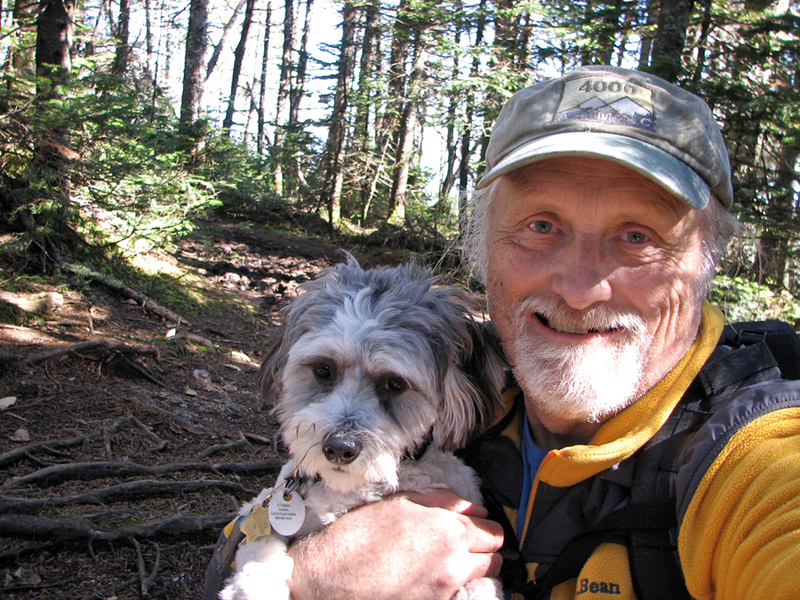 After talking for a few minutes, Patches and I headed down the trail toward East Osceola. Muffin and I had hiked that way back in 2002, but I didn't remember everything about the section of the trail with the chimney. When we got there, I elected to take us down the alternate route around the chimney, which was also steep and rough but which didn't require handholds. I helped lift Patches down a couple of particularly steep sections but all-in-all, she didn't really have much of a problem. Still, it was a rather tiring descent followed by a tiring climb up East Osceola. I was glad when we reached the summit, but was not looking forward to returning the same way. 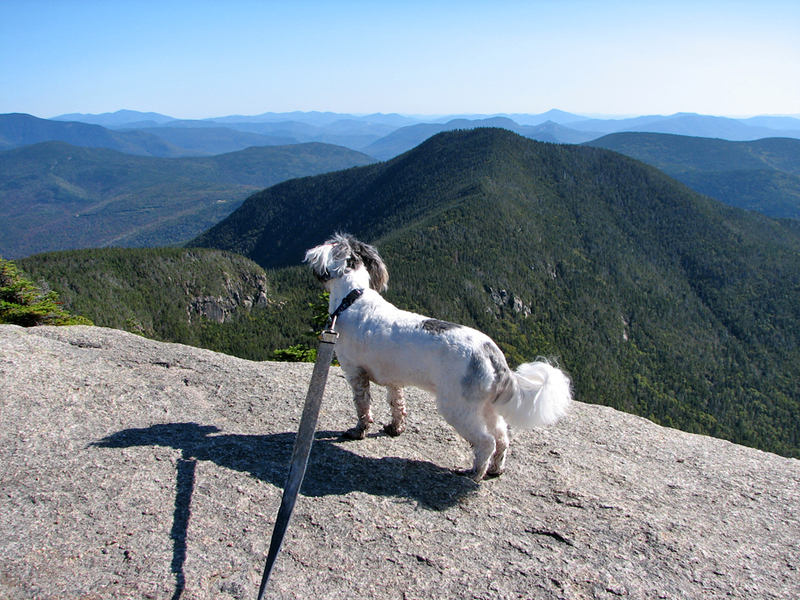 I took a couple of pictures of Patches and myself on top East Osceola, then got to thinking about changing our plan about hiking back over Osceola again. We probably should have just started back the way we came, chimney or no chimney, but I elected to take "the easy way out" and go down the other side of the mountain to the Kancamagus Highway. 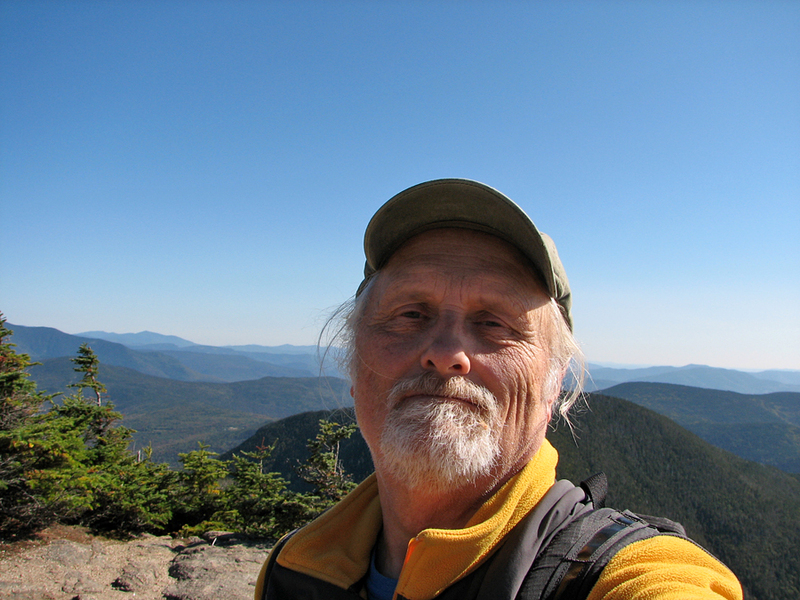 When the two hikers I had met earlier finally appeared, I decided to follow them down, hoping to get a ride into Lincoln and then call the Shuttle Connection to take us back to Waterville Valley. Both of these guys were young and fairly quick, so we made darn good time descending the steep trail down to Greeley Ponds. 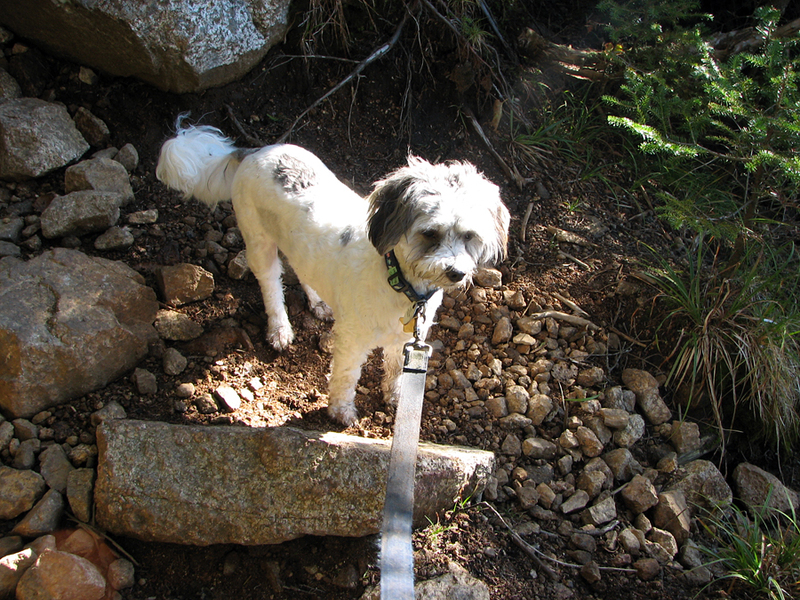 Patches did an amazing job of navigating down even the steepest rockiest sections. On the way, we passed several groups of hikers on their way up who all thought that Patches was quite a good little hiker. Down at the bottom, the guys agreed to give us a ride into town. They left us off in front of Tedeschi's and I called for the shuttle. We had to wait a half hour or so, but the shuttle did arrive and drove us all the way back to our car on Tripoli Road. I held Patches in my lap in the shuttle, and oddly enough, she didn't drool at all. Patches in the shady col just below the Mt Osceola summit cone. Patches looking up one of the switchbacks that ease the ascent up the Mt Osceola summit cone. Patches on the Mt Osceola summit ledgez. 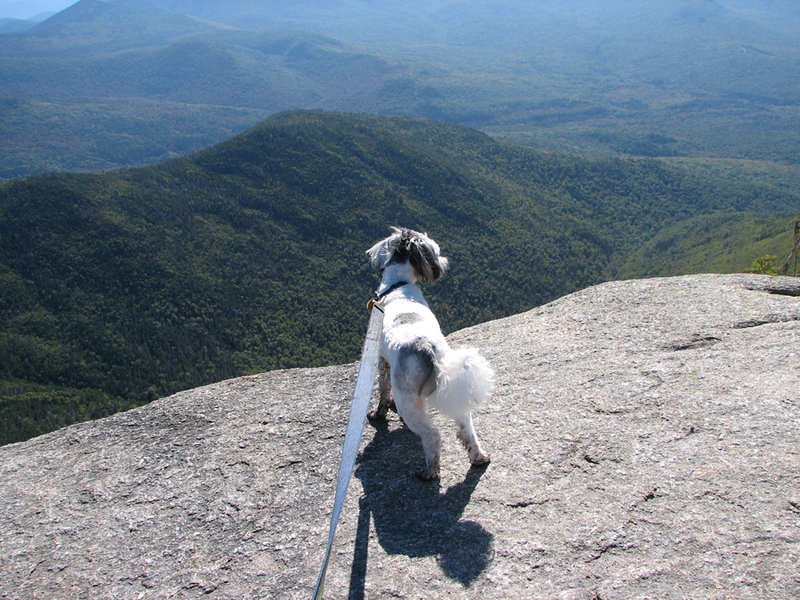 She had no fear of getting close to the edge, which is why I held on tightly to her leash. Patches looking out at East Osceola and its connecting ridge. The chimney idescends the sharp rocky cliff just to the left of Patches' head. 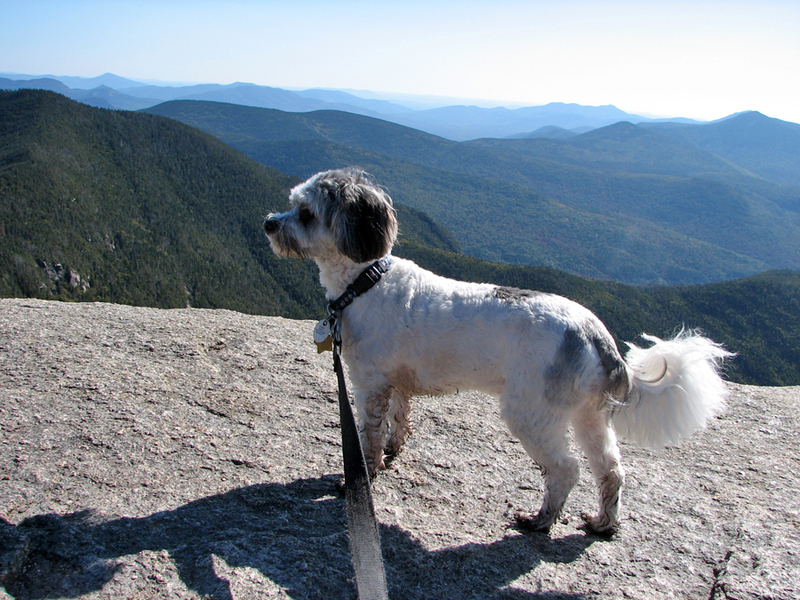 Another shot of Patches on top the Mt Osceola summit ledges. Looking down at the town of Waterville Valley with Sandwich Dome in the background. The ridge leading toward East Osceola. The trail passes over the small hump in the center before dropping steeply down the chimney to the col.
Self-portrait on the summit of Mt Osceola. The Waterville Valley ski sllopes on Mt Tecumseh from the top of Mt Osceola. 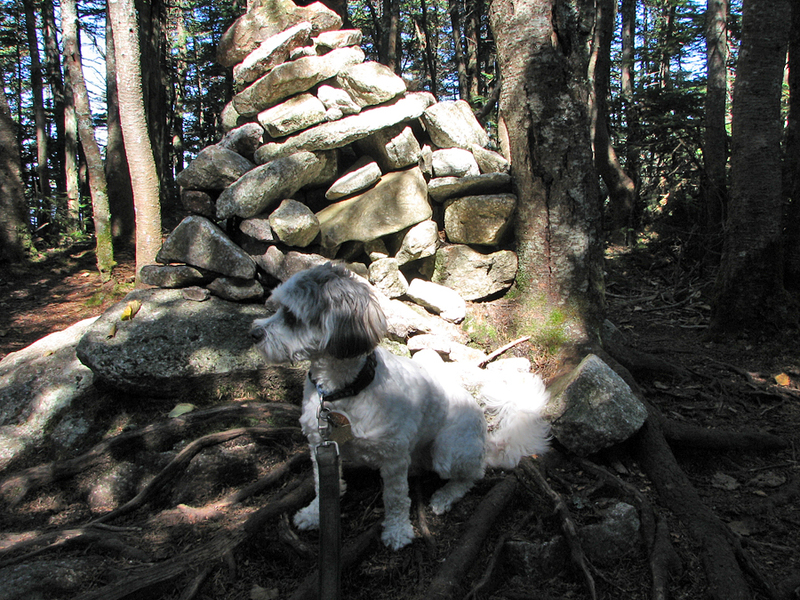 Patches by the summit cairn of East Osceola, her third 4000-footer.